Drombeg Stone Circle, Glandore, Co. Cork (Photo credit: Aaro Koskinen, WIkipedia). Irish grid reference: W 2468 1185. Drombeg Stone Circle (An Drom Beag) is a very attractive ancient monument set in an equally lovely landscape, close to the south coast of County Cork. 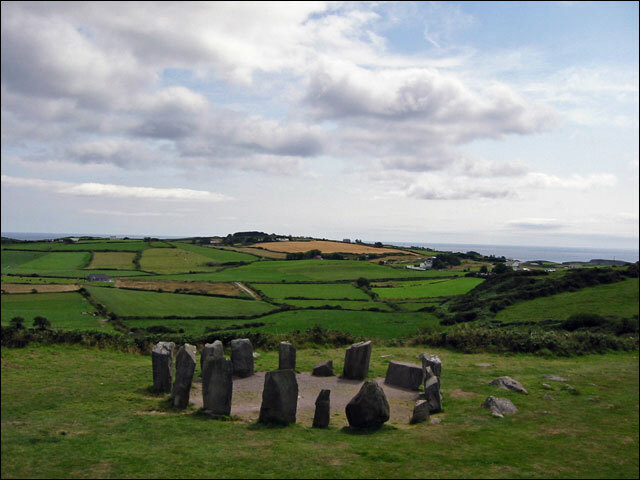 Originally known as ‘The Druid’s Altar’, the circle is located on a hillside, just west of Cregg Lane, near the minor road (R597) almost two miles east of Glandore in the townland of Drumbeg, south of Reanascreena. Although a few of the circle’s stones have now disappeared it is still a reasonably well-preserved monument, which is said to date from the Bronze-Age (2,000-3,000 BC). 40 metres to the west there are a couple of hut circles, a causeway, and a prehistoric settlement with a cooking area (fulach Fiadh) that ‘may’ have continued to be in use at least up until the 5th century AD? The winter soltice can be viewed from the Drombeg circle, indeed there is a very good alignment here. Reanascreena is 6 miles due north, Rosscarberry is 4 miles east, and Skibbereen is 10 miles to the west. The Drombeg circle covers an area of around 9 metres (30 feet) and, there are 13 stones made of a hard sandstone standing in what is an almost perfect circle; originally there were 17 stones. Two of the stones very sadly went missing and so small boulders were placed into their socket holes. The heights of the stones varies ‘roughly’ between 1 foot 6 inches high to just over 7 feet. The two axial (portal stones) at the west-side are a little over 7 foot high, while the recumbant axis stone (the altar) at the southwest side is 6 feet 3 inches long and has two oval-shaped cup-marks, one having a concentric ring surrounding it. This particular stone has a levelled top which is slightly bevelled, making the surface angled down towards the interior of the circle, and is held in place with wedging stones, according to the 2000 edition of the booklet ‘The Stone Circles of Cork & Kerry’ by Jack Roberts. From this stone the rays of the setting sun fall at the winter soltice (Eyres & Kerrigan ‘ Ireland – Landmarks, Landscapes & Hidden Treasures’ 2008). Originally there was a burial pit in the centre of the circle, but this is now covered-over with chippings and gravel, just as it was originally. The axial orientation or azimuth of this circle is recorded as being: 228 degrees and near to 225.50 (Roberts ‘The Stone Circles of Cork & Kerry’). An Archaeological excavation by Prof. E.M. Fahy in the late 1950s examined the construction methods of the circle in some detail, but a more interesting find was a burial pit at the centre of the circle. The author Jack Roberts in his work ‘The Stone Circles of Cork & Kerry’ says: “A burial pit was found near the centre of the circle which contained a broken pot and some cremated bone. Other burial pits in and around the circle were found to contain strange mixtures of broken stone and pottery all as carefully deposited as the human burial in the circle. These curious burials were found at other circles excavated in the area and it appears to be a characteristic of the rites attached to the circles. The interior of the circle was originally paved with small flat pebbles and appears to have been kept clear of growth for some considerable period after construction and Fahy remarked upon the careful tidiness of the site, a factor which accentuated the sanctity of the site.” There may have been a single standing stone at the centre of the circle, but by the turn of the century this had disappeared. The author Jack Roberts ‘The Stone Circles of Cork & Kerry’ referring to the winter solitice alignment at Drombeg says: “It is possible that a deeply etched mark on the north-side Entrance Stone is the marker for such observations and the stamped earth at the Entrance also contributes to the possibility that this is a position that the observer would have stood to make the annual observations. 40 metres to the west stands an ancient settlement that could date from the Iron-Age, if not earlier, but the most interesting aspect to this site is the classic “cooking place” known as a (filuch fiadh). There are two hut circles that are interconnected, and a stone trough with what would originally have been a well, all being linked together by a stone causeway. Water collected from the well and, also food stuffs including meat, would have been boiled and cooked with heated stones in the trough. The causeway would have enabled the ancient people to come to this site over rough, boggy ground. This cooking area and settlement as we said earlier may have been in use during the Iron-Age and, perhaps up until the more recent Celtic period (the Dark Ages). Roberts, Jack., The Stone Circles of Cork & Kerry, Bandia Publishing, Drumfin, Co. Sligo, Ireland, 2000. Eyres, Kevin & Kerrigan, Michael., Ireland – Landmarks, Landscapes & Hidden Treasures, Flame Tree Publishing, Fulham, London, United Kingdom, 2008. Reader’s Digest, Illustrated Guide To Ireland, (First Edition), The Reader’s Digest Association Limited, London, 1992. Categories: Stone Circle | Tags: Drombeag Stone Circle in Southern Ireland, Drombeg Stone Circle at Glandore in Co. Cork | Permalink.